Where are our friends during hardships? Friends and relatives should help us whenever we are in some challenges. Such assistance can be in form of moral, material or financial support or a combination of such. We should also help those in need when and where necessary and possible. This is why the English have a saying: ‘A friend in need is a friend indeed’. But in most cases, in our society, people seem to be good friends and good relatives when things are okay with us. When one is out of employment, his or her business isn’t doing well or has some financial challenges, friends are few; and even some relatives run away from such a person. Why? It’s in this light that one remembers The Post Newspapers (herein called The Post)’s editorial which stated that some politicians were coming to The Post’ proprietor, Fred M’membe; asking him to support their political party to win the August 11, 2016 presidential and general elections through high press covered so that the stated politicians can help to improve on the lives of the majority poor. When such an editorial appeared in The Post, one thought of, probably, United Party for National Development (UPND)’s leader, Hakainde Hichilema (HH) with his current presidential running mate, Geoffrey Bwalya Mwamba who is commonlyknown as GBM having gone to The Post for such a political alliance. With some of the uncivil language that The Post sometimes quotes Forum for Democracy and Development (FDD)’s leader, Edith Nawakwi, one also thought that perhaps, Ms Nawakwi had gone to The Post Newspaper for such a request. At that time, one also speculated that the then Movement for Multi-party Democracy (MMD)’s president, Nevers Mumba might have gone to the Post for such assistance. ‘Could it be President Edgar Chagwa Lungu asking The Post for such a favour? Which presidential candidate went to The Post for such a request?’ some people wondered. So, one can see that when some politicians and their political parties had challenges on how to win the forthcoming elections, they looked to The Post for help to easily win the next elections. But how easy can a newspaper help one to win an election? From the stated The Post’s editorial, it was clear that M’membe didn’t buy such political ideas; giving reasons that he knew that such politicians weren’t in politics to help the poor; but to enrich themselves. Therefore, M’membe turned down such a request for high political campaign Post Newspaper coverage for such politicians. Now to learn that The Post has had an outstanding tax debt with Zambia Revenue Authority (ZRA) accumulating for some years to about K53million, one wonders where The Post’s friends and those political party leaders who sought The Post’s support to win in the next elections were for such a debt to reach such alarming levels. In The Post’s situation, what are friends and relatives for? Is it that M’membe has no friends and relatives? Considering how huge The Post’s debt with ZRA was; and its legal implications on the newspaper, Rainbow Party’s leader, Wynter Kabimba once suggested that Zambians should contribute some money to help The Post settle such a tax obligation. Mr Kabimba suggested so because as Higher education minister, Michael Kaingu said, in other countries like United States(US), United Kingdom(UK), withholding or evading tax is a criminal offence which can lead one to imprisonment(Daily Nation: 25/6/2016; p.1). The Post’s tax arrears had been in courts of law for some time before the verdict passed in favour of ZRA. After the court ruled in favour of ZRA, the latter closed The Post’s offices. As a result, one also expected people like HH, GBM, Guy Scot, Miles Sampa, Kabimba himself and many others to contribute some money to bail out The Post’s debt with ZRA. 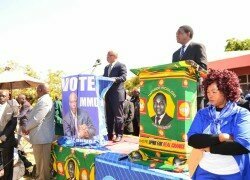 Contrary, HH was quoted saying that he would go countrywide to mobilise Zambians to demonstrate against the government for closing The Post’s offices for its debt with ZRA. As a result, it’s reported that HH, some US embassy and some United Nations (UN) officials among others attacked the government for closing The Post’s offices for non-payment of such a liability. It was also reported that HH and such organisations urged government to revisit their decision against the closure of The Post’s offices. Up to now, no Zambian demonstrated against government for ZRA having closed The Post’s offices. Consequently, one wondered how foreign embassies and UN could interfere in such a straightforward legal tax related issue. This was more puzzling because, as Hon. Kaingu stated, in developed countries, tax obligations are not negotiable; and every citizen and organisation is obliged by law to pay appropriate type and amount of tax on time. Because tax related obligations aren’t negotiate in developed countries, infrastructure development and socio-economic services in such countries are high and of good quality. High tax obligation adherence helps respective governments to reduce high levels of unemployment and those of poverty. Therefore, to learn that HH, some US embassy’s and some UN officials were blaming the government for closing The Post for withholding tax for some years, one wondered where the public interest and the logic were for such officials to attack our government for enforcing tax laws. Us embassy’s and UN’s officials attack on the Zambian government for closing The Post Newspapers was shocking because such organisations in Zambia contribute a lot to make Zambia improve on its socio-economic conditions for the benefit of many citizens. One also wondered why, with such US embassy’s and UN officials’ knowledge on importance of paying tax to government, they couldn’t just do what Mr Kabimba suggested that Zambians or any other sympathetic person or institutions should contribute some money to help The Post settle such a debt; instead of blaming the government for ZRA enforcing the tax laws! It’s important to remember that due to inadequate government revenue from taxes, Zambia has few medical doctors and few health nurses. Zambia also has few schools and few teachers to cater for all school-going children throughout the country. School classroom blocks aren’t enough for each group of school going children. Therefore, it sounded strange for HH, some US embassy’s and some UN’s officials to blame government for closing The Post’s offices when it’s the same newspapers and its associates that castigate the government that Zambians are suffering because the Patriotic Front (PF) government is doing nothing to improve the living conditions of many citizens. So, how can government forgive an institution that owes it millions of Kwacha in tax arrears when the same government’s hands which are tied due to many socio-economic demands from many citizens, which can be solved by enough government revenue from taxes? Suggesting that government should forgive or waive tax payment for The Post for whatever reasons, reminds one of a situation where tenants, their friends and relatives expect a landlord to forgive a defaulting tenant who fails to pay rentals for whatever reasons when the same friends and relatives can contribute some money to pay rentals for their defaulting friend or relative. Donors and HH shouldn’t attack the Zambian government for ZRA closing The Post’s offices for not paying K53million tax obligation. They should blame the Post for not paying legal taxes; and just pay on behalf of The Post if they sympathise with the newspaper for whatever reasons. Learning that a foreign donor has offered to pay in full the K53million on behalf of The Post (Daily Nation: 25/6/2016; p.1), one wonders whether these are The Post’s friends living in Zambia hiding in the name of a foreign donor or it’s really a foreign donor who has volunteered to settle such a debt. Government should investigate who this foreign donor who has offered to settle The Post’s debt with ZRA is because, in future, this might be another security issue in our country. Assuming that it’s really a foreign donor who has bailed out The Post of its debt with ZRA, then, it speaks volumes about some of the opposition political leaders who aspiring for republican presidency for this country. And it’s also reported that M’membe, The Post’s proprietor had deliberately allowed such a tax debt to accumulate to such astronomical levels because he knew that someone out there would pay such a high debt on behalf of M’membe if government closes The Post (ibid). Now, if such political leaders aspiring for high government positions cannot help their own friends such as Fred M’membe, can such leaders help ordinary Zambians when they are in government while the economically vulnerable, the disabled, the aged and the orphans are suffering? That it’s reported that it’s a foreign donor who will pay The Post’s tax debt, M’membe should know that he has few or no genuine friends. But could it be that M’membe’s friends were reluctant to help The Post settle its tax debt because the latter refused to support some of its friends in their political candidature for Zambia’s presidency? Or has M’membe now accepted the request to help a certain presidential candidate win the forthcoming elections through high coverage in The Post? Anyway, friends should help each other in times of difficulties. To know which foreign donor helped The Post on its tax debt, some clues might be known depending on how The Post will be covering the political campaigns for various presidential candidates as we approach August 11, 2016 polls.